I’m finally back from various conferences I attended these past two weeks. 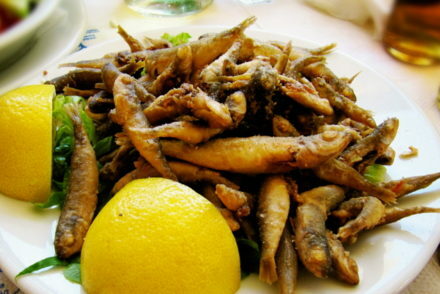 The first conference, The Mediterranean Diet and Health conference that took place in Greece, gathered top Mediterranean Diet and Olive Oil experts from Harvard such as Walter Willett and Eric Rimm, as well as Antonia Trichopoulou and Olive Oil researchers Prokopis Magiatis and Eleni Melliou. There were a variety of sessions, but today I will focus on presentations given by Dr. Magiatis and Dr. Melliou who provided information we need to know when buying and using olive oil. We need to know that not all oils are the same. By oils I do not mean only olive oils. 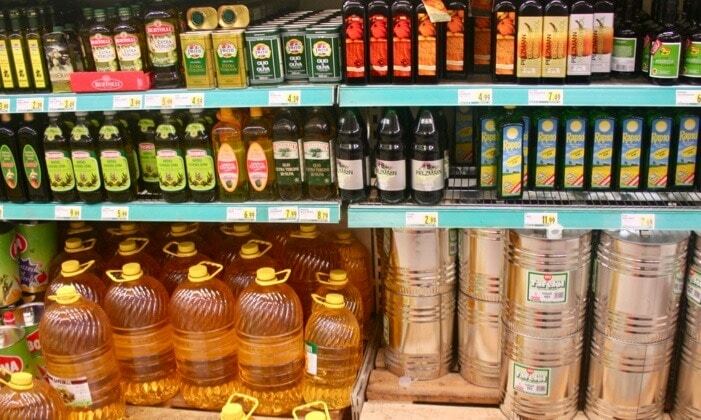 There are several cooking oils on the market that are rich in monounsaturated fats (as opposed to saturated fats) and therefore are making claims of being heart healthy. 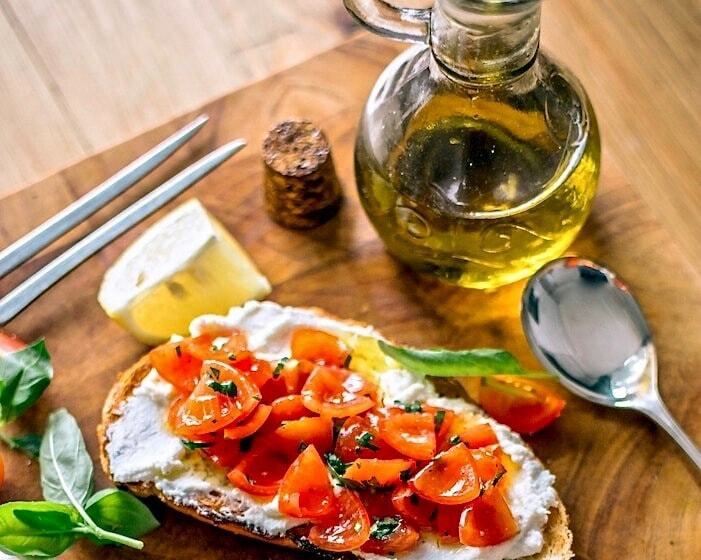 But as Dr. Magiatis notes, olive oil is not only a simple source of good fats: it contains monounsaturated fats but also unique minor compounds that can have a positive impact on health and most importantly can only be found in extra virgin olive oil. So while other oils may be promoting themselves as heart healthy, the reality is that only olive oil has antioxidants and other compounds that play an important role in health. 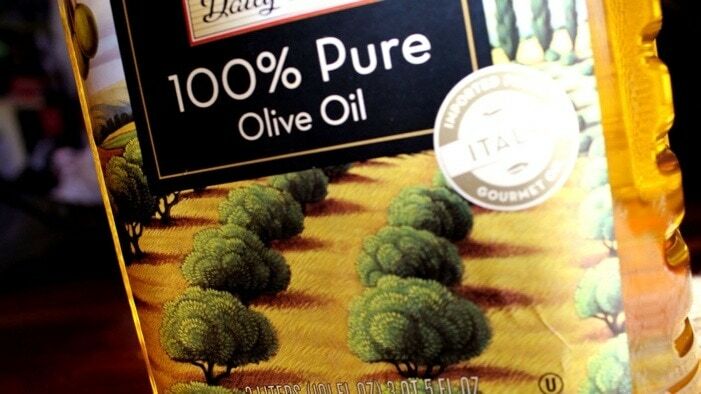 As a nutritionist I always look at labels carefully (which is why my trips to the grocery store often last for hours), but the reality is that misleading labels especially for olive oil are very common, particularly on the front of the label. Here is a photo (below) of a slide in the presentation (apologies for the quality –it was dark) that shows how certain companies use misleading terms. Here for example we have “classico”, “extra light”, and “pure” olive oils. These olive oils are not classic or extra light or pure. 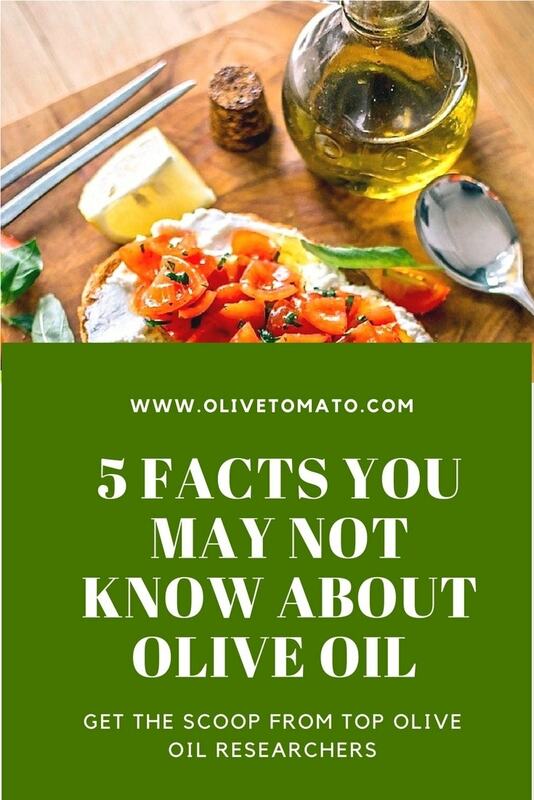 They are in fact low quality olive oils that have been refined physically and chemically to remove undesirable qualities such a free fatty acids and unpleasant flavor and odor and they contain no healthy antioxidants. 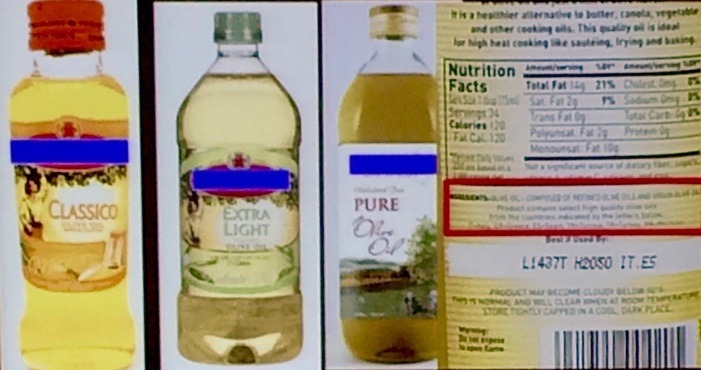 And as Dr. Melliou notes they are often the same price as extra virgin olive oil (the real thing) so read labels carefully! You may have thought that buying a pre-made olive oil vinaigrette or other salad dressing made with olive oil is good for you. However, olive oil compounds such as oleocanthal and oleacein which have antiinflammatory and antioxidant properties are very sensitive to water. 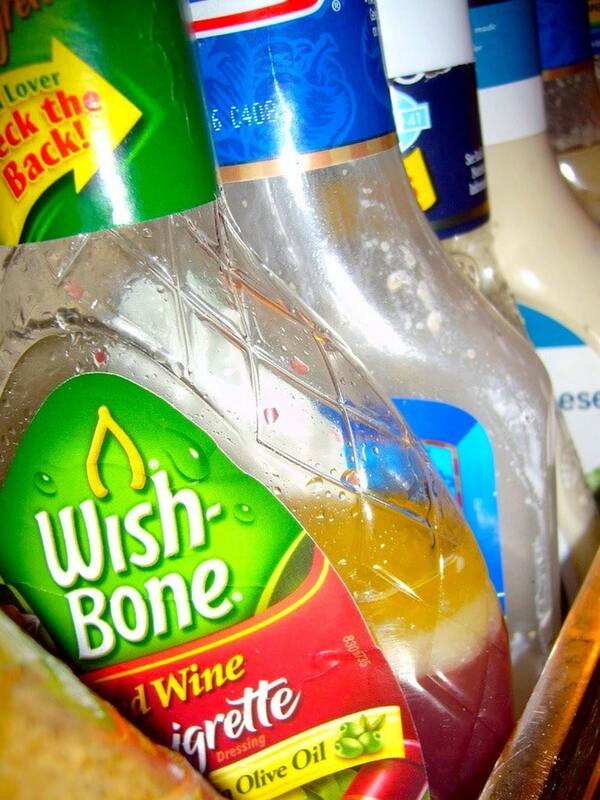 So those salad dressings that may contain extra virgin olive oil will have very little -if any- of these protective substances. If you are making salad dressing at home, use it right away, do not make olive oil based salad dressings ahead of time if you want to get all those good antioxidants. Last week I also attended the Food and Nutrition conference and expo in Chicago, a conference that is organized by the Academy of Food and Nutrition geared towards U.S. dietitians. Once again on the expo floor there were various booths promoting a variety of oils (not olive oil) and how they are better for cooking (compared to olive oil) because they have a higher smoke point. This is not correct and a very popular misconception. First let’s think about the Greeks and Southern Italians in the 60’s who were virtually cooking everything with olive oil, because that’s all they had (butter was a luxury) and they had the highest life expectancies in the world. 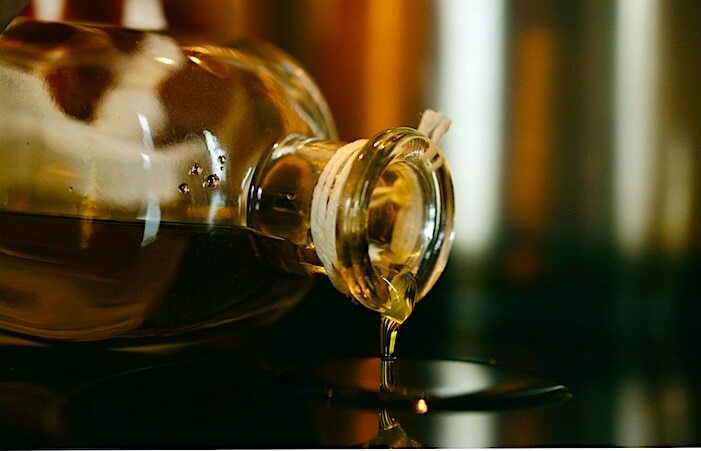 But more specifically, extra virgin olive oil has a higher smoke point than many refined olive oils, it also contains the polyphenols that reduce the rate of oxidation. Smoke point ranges at about 365 to 410 degrees Fahrenheit. So unless you are doing industrial deep frying you will not reach the smoke point on your home stovetop. Of course as with most foods, heating will cause some loss of the antioxidants. 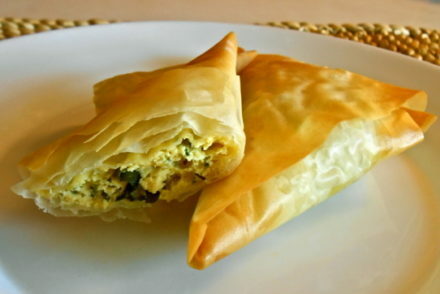 And by the way if you are deep frying that often, maybe the oil you use is the least of your worries. 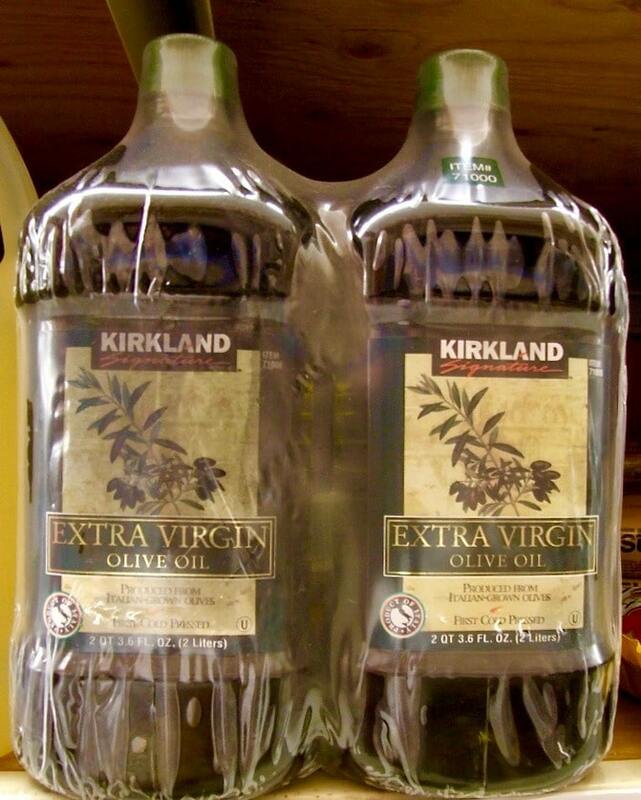 I know, I know you found some 2 quart extra virgin olive oil at Costco at such a great price, but the reality is if you don’t use it somewhat quickly you are missing out on a lot of those antioxidants that are sensitive to oxygen. As Dr. Melliou mentions leaving a container with olive oil half empty for a long time can be detrimental to those protective compounds. Buy small bottles or alternatively empty the olive oil in small dark bottles and keep them closed so that the exposure to oxygen is minimal. 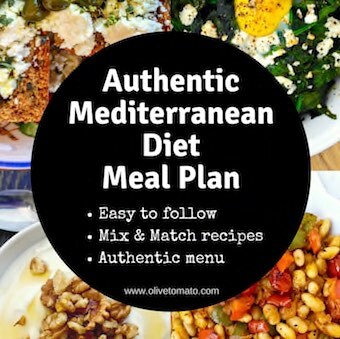 The Mediterranean diet goes mainstream, but it wasn’t always that way, it was once thought to be harmful. 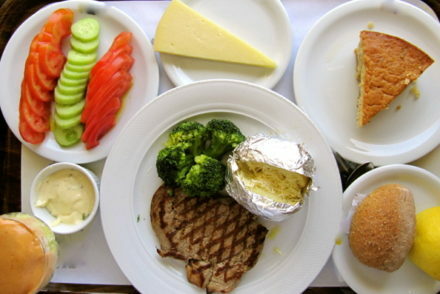 The Mediterranean Diet now being served in hospitals, but not where you think. I do buy metal jugs of extra-virgin Greek olive oil from PA, a Greek supermarket nearby, but I always pour the oil into dark-green 750ml olive oil bottles. I have a limited budget but am committed to using extra-virgin oil and other nutritious ingredients. Thanks Eva! I’ve heard good things about Cypriot olive oil.